Blue Wave or Red Save? On Thursday, another pair of bombs en route to critics of Donald Trump were intercepted. The newest targets were Joe Biden, who has been particularly willing to get into the gutter and spar with the President, and actor Robert De Niro, who has been outspokenly anti-Trump, particularly the occasion at the Tony Awards where he shouted "Fu** Trump!" in front of an audience of tens of millions of people. This brings the number of bombs to 10. The FBI, of course, is hard at work trying to figure out the packages' origin. Reportedly, they think they may have come from the state of Florida. There is general agreement that there was essentially no chance that the bombs could have detonated. It's possible that the miscreant did not know what he was doing, or it could be that the packages were meant to frighten, and not to actually do physical harm. Given that one of the targets of the mystery bomber was CNN, this is dangerously close to announcing "They got what they deserved!" Needless to say, that will do little to discourage folks who might be inclined to follow the mystery bomber's lead. Other Republicans carried this torch as well. That includes Trump's new BFF Sen. Ted Cruz (R-TX), who declared, "Look, it's the media's doing what the media does, which is any narrative that they can twist against Trump, they will do so." Trump also liked dozens of "false flag" tweets. False flag theories were also all the rage on right-leaning programs at the fringes (Alex Jones, Breitbart TV), and also those closer to the mainstream (Lou Dobbs, Rush Limbaugh). Despite what you might have heard, no wall has been built along the Mexican border since Donald Trump became president. Still, anti-immigrant rhetoric is his bread and butter (it was literally what launched his campaign), and he has regularly gone back to that well in the past few weeks as he's tried to fire up the base in advance of the midterms. He's had a near-obsession with the caravan of refugees marching their way toward the U.S. border, and has even tried out a few wild, unsupported claims, like that there are a bunch of terrorists hiding in amongst the members of the caravan. That one was so dubious that Trump was actually forced to admit he had absolutely no evidence for it. It would seem that words are not getting the job done, though, because Trump has now moved on to action. He has ordered Secretary of Defense James Mattis to dispatch 800 soldiers to the border, to protect it from...the caravan, presumably. HHS Secretary Kirstjen Nielsen said the move was necessary to protect against "violent" Mexicans, and explained that, "We do not have any intention right now to shoot at people." This would seem to leave open the possibility that shooting at people could eventually be on the agenda. In any case, this is clearly a PR move more than anything else, not unlike a miniature version of Trump's now-shelved military parade. David A. Andelman, writing for CNN, has an interesting piece trying to read the tea leaves (literally) in terms of where the Donald Trump vs. Xi Jinping boxing match is headed from here. He thinks that the window might be closing on Trump's ability to make a deal, and that the Chinese might be getting ready to hunker down and just wait for the next president. Because it's an economic piece, Andelman's analysis has a lot of moving parts. However, at the heart of it is that a worldwide downturn in the stock markets will put far more political pressure on Trump than it will on Xi. First, because Xi doesn't have to worry about getting reelected in 2020, and second because roughly half of American households have money in the stock market in one way or another (often through retirement accounts), whereas less than 10% of Chinese households do. It is also the case that the Chinese have a history of playing the long game, and have for centuries, if not millennia. Heck, the Great Wall took over 1,500 years to build. If that's not the long game, both literally and figuratively, then nothing is. Depending on how things unfold, the Chinese could also do a number of things to make life uncomfortable for Trump. They know that anything that slows the growth of the U.S. economy will increase the size of the hole that the tax cut blew in the budget. So, they could choose to stop buying American bonds, which would compel the U.S. Treasury to start paying much higher rates of interest. It's even possible that they could start dumping the bonds they have, which would really make it harder for the federal government to borrow the money it needs. Xi could also dump some of his reserves of U.S. dollars, or "encourage" his citizens to boycott American products, or sign long-term trade deals with countries other than the U.S. It is less than two weeks to the midterms. Given the passions that Donald Trump inspires, both among supporters and foes, not to mention that America's political parties are in the midst of a realignment, this election has no real historical analogue. And so, psephologists of all stripes are looking behind curtains and under rocks for clues as to what might happen. Clearly, no party in recent memory has had so few uncontested seats (aka, "freebies") as the GOP this year. Just like the old basketball line that you miss 100% of shots you don't take, you also lose 100% of elections where you don't even field a candidate. 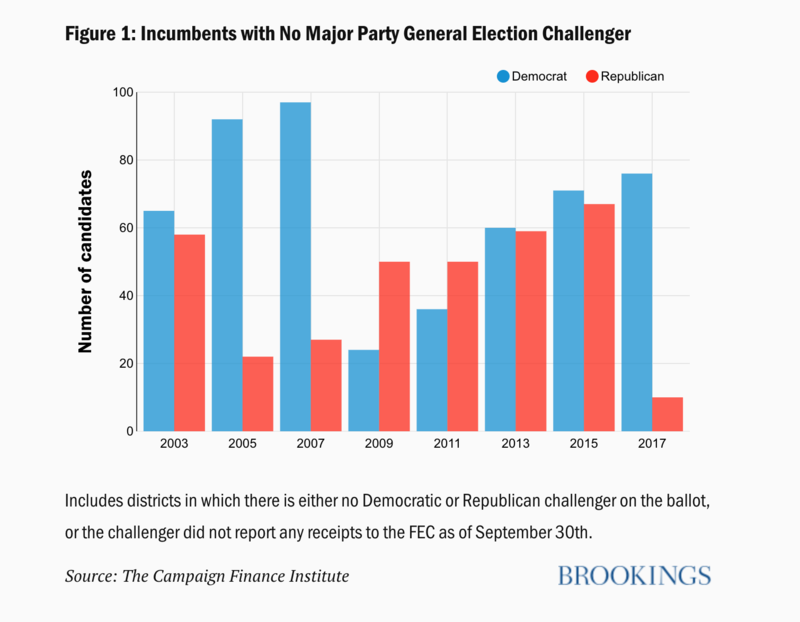 So, having someone challenge all but 10 GOP-held seats is, on its face, a good thing for the Democrats. 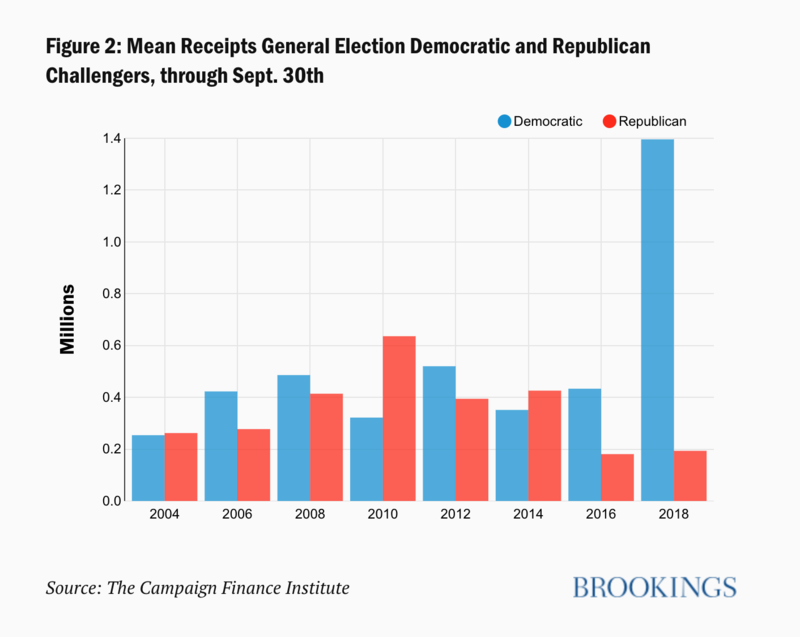 Further, the two years most like this one—2006, when the folks who took office in 2005 went before voters, and 2010, when the folks who took office in 2009 went before voters—both resulted in waves. In the former case, the Democrats contested all but 22 GOP seats, and ended up gaining 31 overall; in 2010 the Republicans contested all but 24 Democratic seats, and ended up gaining 63 overall. Clearly, the Democrats are rolling in dough in a way that has no precedent. That is particularly the case in elections where the Republican-held seat is open. In those 42 instances, the Democratic candidate has raised an average of about $2.3 million. This money might buy useful things like TV time, or it may primarily be meaningful as an indication of enthusiasm, or it may prove to mean not much at all. Still, just in case it matters, a party would obviously rather be in the Democrats' position than that of the Republicans. Sen. Heidi Heitkamp's (D-ND) vote against Brett Kavanaugh may end up costing her a chance at reelection. What it hasn't cost her, however, is campaign funds. In fact, she is awash in cash from donors since she cast that vote, to the tune of $12.5 million in the first 17 days of October. By contrast, in all of Q3 (July to September), she pulled in $3.8 million. Nearly all of the $12.5 million came in the form of small donations from outside North Dakota. Last week, Gov. Bill Walker (I-AK) dropped his reelection bid after his running mate was accused of some (unspecified) form of sexual harassment. At that time, Republican challenger Mike Dunleavy had a sizable lead in polls over both Walker and the Democratic nominee, former senator Mark Begich. I think it better be a white male. When you have a white male making the arguments, they carry more weight. Should they carry more weight? Absolutely not. But do they? Yes. Florida Bill Nelson* 46% Rick Scott 45% Oct 16 Oct 23 Strategic Research Assoc. Oct20 Will There Be a Trump 2020? Oct20 How About an O'Rourke 2020?